Life with Lynnie: No Other! Once again, here on Life with Lynnie (LwL), I'll be addressing an issue. It's a dangerous issue. Okay. I realize some people don't believe that Islam is dangerous. Some people believe it is a religion. 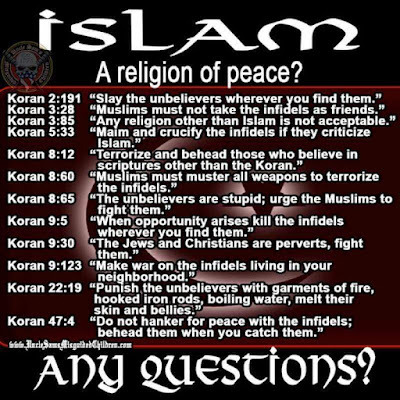 Muslims claim it is a religion of peace. Truth is, it is an ideology. It is a way of life, that has been determined by the writings of someone Muslims believe is their god. Even though that person is NOT God. God's Word, our Bible tells us. And, we need to have no other god. Ever. In any way. Just as we read, in Exodus 20:3, "Thou shalt have no other gods before me." Hopefully, you realize that when we just read that we shalt have no other gods before me, it was part of the Ten Commandments. We are to have NO other gods before Him. And, claims to be a religion of peace. Even though it is not. The only peace it offers, is to fellow Muslims. Not to us. Or, anyone else in this world. Why? Because we who are not Islamic, are infidels... unbelievers of Islam. Non-Muslims. And, infidels are hated. Infidels are to be converted to Islam... or, are to be murdered. Well, check out this pic that I am sharing with you. No. I didn't create it, but someone on Facebook (FB) did. So, I'm sharing it with you. Hopefully, you took a minute or more to read it. 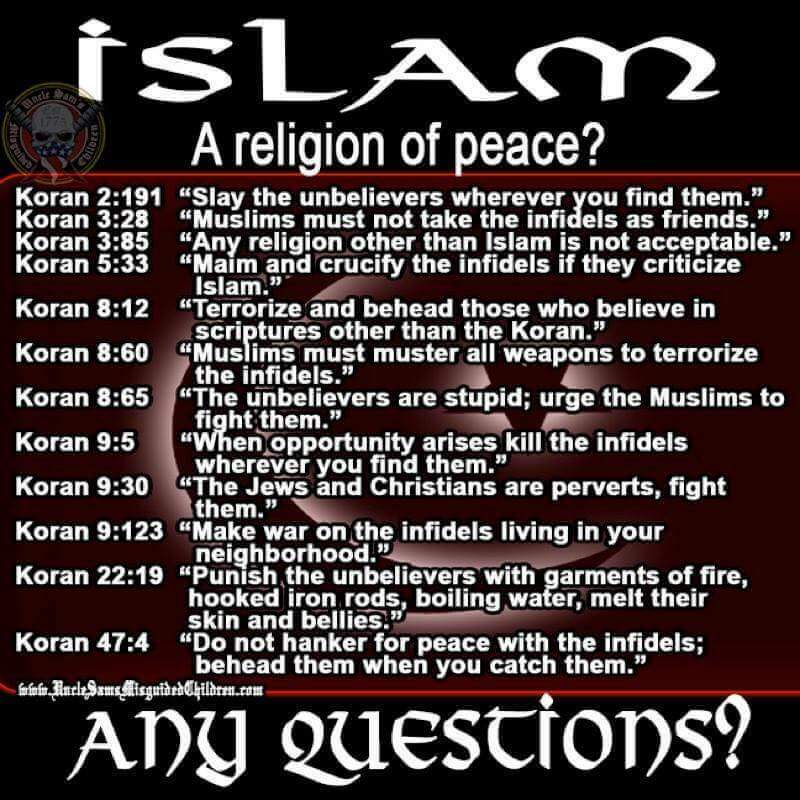 This info used was from the Qur'an, or Koran as some English speaking people call it. The Qur'an/Koran is Islam's type of bible. Anyone who is Christian realizes that the Islamic/Muslim holy books are not books of God. Because they are not worshipping our God. Or, using our Bible. My friend, please understand I am not hateful. I'm not hateful of anyone. Not even Muslims. The reason I speak up/out is because I have taken courses in the past, about understanding Islam. Plus, I am fulfilling what God would have me do. He wants us to speak truth. And, love others. Just as I do. I also plant seeds for Christ, whenever I can. Even to Muslims. After all, God did tell us to preach the gospel to all the creatures of the earth. Hopefully, you do this, too. If you do, you will be blessed, by God.